A "massive, massive amount of innovation is coming" in the next generation of thin-and-light ultrabooks, Intel executive Kirk Skaugen said at the Intel Developer Conference here on Tuesday. The chip giant is preparing its fourth-generation Core chips, code-named Haswell, for a new rush of ultrabooks in 2013 that will feature smartphone-like voice recognition, touch, finger tracking, augmented reality, and gesture-based interfaces courtesy of clip-on sensors that will eventually be integrated into laptops, and more. Intel has teamed up with some key partners to begin rolling out some of those interface capabilities. Later this year, it will release an introductory software developer package it's calling Intel Perceptual Computing SDK Beta. Early developments on this front include a voice-recognition tool by Nuance called Dragon Assistant that will start appearing in Dell ultrabooks later this year. Skaugen also showed off a Kinect-like ultrabook accessory built by SoftKinetics and Creative that combines an infrared close-range gesture tracking camera and dual-microphone—that unit will start shipping in 2013 and be priced at $149, he said. 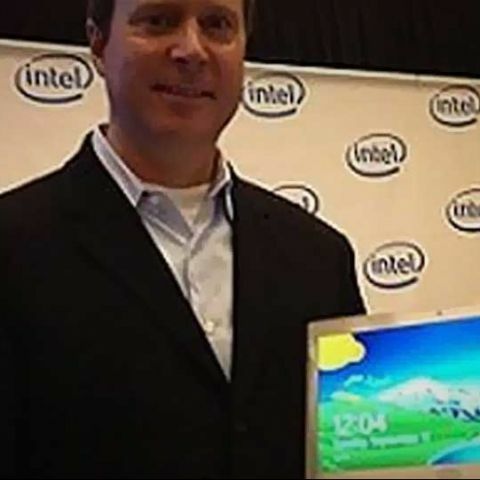 Some of the new interface technologies, like voice recognition, will start appearing in ultrabooks built around Intel's current-generation Ivy Bridge-based chips, said Skaugen, an Intel corporate vice president and general manager of its PC Client Group. But Haswell will be the first processor architecture that Intel built from the start with ultrabooks in mind, he added. That will open the door to what Skaugen promised would be "the most innovation over the next 20 months" from Intel than at any other point in the company's storied history. Intel kicked off its ultrabook initiative at last year's IDF, ramped it up at the beginning of this year at CES, and rolled out the first Ivy Bridge-based ultrabooks in the spring. Inarguably inspired by the success of Apple's MacBook Air line of laptops, Intel's ultrabook initiative was a not-so-subtle nudge to its OEM partners to start making thin-and-light, fast-booting, visually attractive laptops for under $1,000. Now Intel aims to take the ultrabook on the next stage of a journey that looks to blur the design and usage lines between traditional laptops and consumer tablets, a category that the chip giant has famously found it tough to penetrate. Skaugen said there are about 70 ultrabooks on the market at the moment. Next year, Intel is banking on doubling that number. With next month's release of Microsoft's new Windows 8 operating system, 40 upcoming ultrabooks will be touch-enabled, he said. Going forward, makers of ultrabooks will start to integrate sensors and technologies commonly found in smartphones and tablets, like gyroscopes, accelerometers, GPS, NFC, and 3G and 4G-LTE connectivity, he added. The next wave of ultrabooks will include tablet-morphing form factors that Intel is broadly breaking down into two categories, convertible and detachable. Upcoming convertibles Skaugen showed at IDF feature mechanics that allow users to swivel and flip a clamshell into a tablet, slide screens into position to do the same, or simply fold back a display onto the base to form a slate. Detachables, well, the name is self-explanatory—these units have displays that serve as laptop screens when they're attached to a keyboard and as tablets when you pop them off the base. Incidentally, Intel is pushing for the same sort of mechanical adaptability to be applied to all-in-one desktops. Skaugen demoed a new touch-enabled all-in-one from Sony called the Vaio Tap 20, which can be easily maneuvered into an angled easel position or even made to lay flat on a tabletop, turning it into a Surface-like family slate. Future all-in-ones could come with battery packs and be completely detachable from their stands, he said. Haswell is the key to a lot of this stuff happening, according to Intel. The next-gen Core processors will feature the same 22-nanometer process as Ivy Bridge, but they've been designed to better integrate ultrabook-driven technologies like deep security and fast boot times, as well as for the host of new interface capabilities Intel is planning. The chip giant has also managed to bring the thermals down for its next-gen laptop chips by a considerable amount, mainly by taking advantage of 22nm process technology and baking in more advanced power management for extending battery life, Skaugen said. The upshot is that Intel's main lineup of Haswell chips for ultrabooks will draw 15 watts, down from the Ivy Bridge generation's 17 watts—itself a big improvement on the 35-watt chips Intel had previously offered for laptops prior to its ultrabook initiative. But there's more. Haswell will also include a class of processors that draw just 10 watts—those will target the ultrabook convertible / detachable form factors, Skaugen said. Does anybody know how to get the Serial KEY of Microsoft Visual Studio 2013?